MamaEatsClean: Cauliflower, Curry, Candida and Canada! 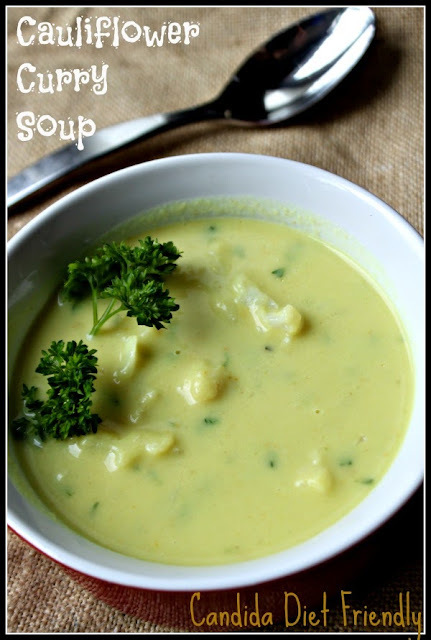 Oh Canada, you need some of this Clean Curried Cauliflower Soup................its Candida Friendly. Now that's a mouthful. Ha, ha! This is one of my favorite cauliflower recipes yet. And my new favorite soup. My old favorite was Butternut Squash Soup. But I can't have that anymore. And another favorite was the Carrot Ginger. But I can't have that anymore either. But this one is totally Candida diet friendly. Yay. I can have as much as I want. The curry gives it a bit of bite and the pureed cauliflower makes it nice and creamy. A great combination. So I hope you have a Happy Canada Day! Make some soup. And say Thanks for living in such a great country. Where cauliflower is plentiful. Bring cauliflower, chicken stock, garlic, salt, pepper and curry to a boil in a saucepan. Reduce heat, cover and simmer for 10 minutes or until cauliflower is fork tender. Let cool until safe to handle. Add 1 Tbsp fresh parsley. Fully puree with immersion blender (be careful if soup is still hot). Add coconut milk and roasted cauliflower. i have everything but coconut milk. any subs for it or shall I wait till I get to the store?